In a mixing bowl, combine brown sugar, salt, chili powder, paprika, onion powder, garlic powder, cayenne and ground coffee together to create rub. 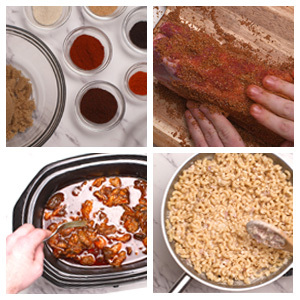 Coat pork shoulder with rub, place in a slow cooker, and coat with BBQ sauce. Cover and place on low heat for 8 hours. After 8 hours, use two forks to shred the pork in the slow cooker. Bring a large pot of water to a boil over high heat. Add macaroni and cook according to package directions. After macaroni is cooked, return the empty pot to the stove. Add olive oil, garlic and onion together, and cook over low heat (about 5–7 minutes). Season with salt and pepper as desired. Stir in the half and half and when the mixture begins to simmer, add the cheese and whisk until smooth. *Saving a few Tbsp. of the reserved pasta water can help thin out the sauce if the macaroni-and-cheese sauce is getting too thick.